Many types of modern birds eat seeds from time to time. It's a concept so familiar to us that the idea of "bird food" is likely to conjure up imagery of seeds, and indeed seeds probably comprise the majority of food that we offer to both pet and wild birds. It has even been suggested that seed-eating helped the ancestors of modern birds survive the end-Cretaceous mass extinction. However, living on a diet composed primarily of seeds is something that only a relatively small number of bird groups do. Many of these seed-eating birds are passerines. Though most modern birds can perch, passerines are often called "perching birds" because their feet are particularly specialized for this task. As a whole, passerines account for about 60% of modern bird diversity, but most seed-eating specialists belong specifically to a group of passerines called Passeroidea. Seed specialist passeroids include finches, sparrows, buntings, cardinals, weaverbirds, estrildids (such as the colorful Gouldian finch of Australia), some tanagers (including Darwin's "finches", which are not really finches), and more. All of these birds have heavy-duty, cone-shaped beaks that they use for cracking open seeds. It's perhaps not surprising that bites from seed-eating passeroids are among those most dreaded by bird banders. Based on the latest estimates, seed specialist passeroids evolved fairly recently during the Miocene, roughly 15 million years ago. Thanks to a new discovery, however, we now know that other birds led similar lifestyles to finches and sparrows long before these groups had even appeared. In a new study, Daniel Ksepka and colleagues named two new species of Eocene birds that exhibit adaptations for seed eating similar to those of seed-eating passeroids. One of these new species, Eofringillirostrum boudreauxi, came from the early Eocene Green River Formation in North America, making it about 52 million years old. It was a small bird, about the size of a red-breasted nuthatch, and is known from an excellent specimen, a nearly complete skeleton preserved with feathers. Its most notable feature, however, is its stout, cone-shaped bill, which bears a strong resemblance to that of finches. 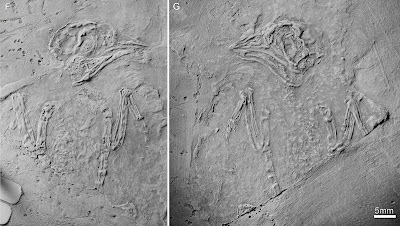 The holotype of Eofringillirostrum boudreauxi, from Ksepka et al. (in press). The other new species was also assigned to the genus Eofringillirostrum, and was named Eofringillirostrum parvulum. This species came from the other side of the globe, the Messel Shale in Germany (which dates to about 47 million years ago). It was even smaller than E. boudreauxi, though its head was proportionately larger. 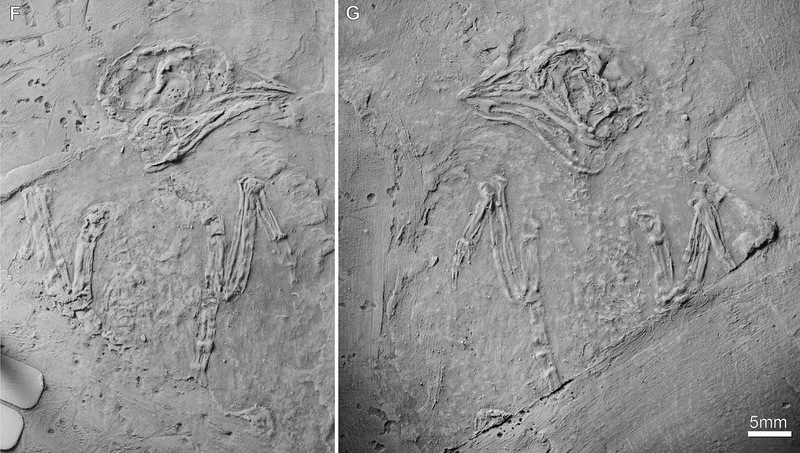 The type specimen of E. parvulum is not quite as well preserved as that of E. boudreauxi, but the finch-like skull is evident. 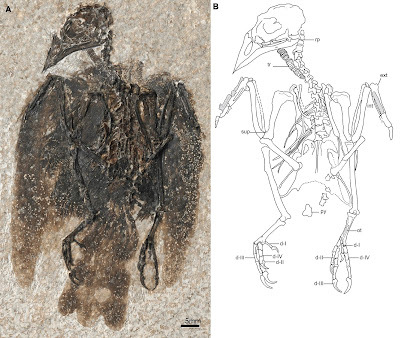 The Green River and Messel are two of the richest fossil sites when it comes to preserving Eocene bird fossils, and Eofringillirostrum is not the only Eocene bird genus that has been found at both localities. Some other birds that are known to have had similar distributions include the stem-roller Primobucco and the rail relative Messelornis. The holotype of Eofringillirostrum parvulum, from Ksepka et al. (in press). Though their similarity to finches is striking, the skull of both Eofringillirostrum species is notably different from those of finches in having a prominent projection at the back of the lower jaw. This is a feature typically found in birds that can open their jaws widely. The describers of Eofringillirostrum speculate that this ability allowed it to swallow large seeds and deposit them in its crop (a pouch for temporary food storage at the base of the throat in birds), or helped it gulp down fruits as an alternative food source. 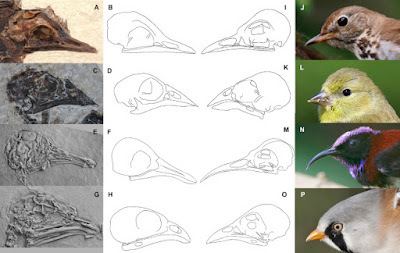 The skull of Eofringillirostrum (B), compared to that of a speckled mousebird (A), which has a similar projection behind the lower jaw, and an American goldfinch (C), which has a similar cone-shaped bill, from Ksepka et al. (in press). 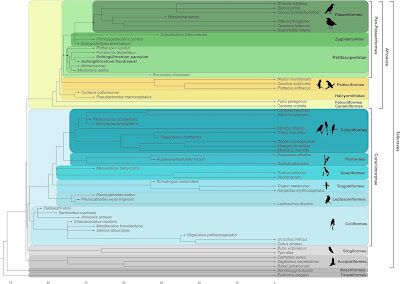 To find out how Eofringillirostrum was related to modern birds, the describers included it in a phylogenetic dataset along with many other species of telluravians, a diverse group of mainly tree-dwelling birds including passerines, parrots, birds of prey, woodpeckers, and more. When this dataset was analyzed, Eofringillirostrum turned out to be a stem-passerine. In other words, passerines as a whole are its closest living relatives, but it was not a member of the group exclusive to extant passerine lineages. It certainly was not particularly closely related to finches or any of the other seed-eating passerines today. Furthermore, Eofringillirostrum was found to be a member of a specific group of stem-passerines, the psittacopedids. This group includes several other Eocene birds, including Psittacopes and Pumiliornis from the Messel and Morsoravis from the Fur Formation in Denmark. Psittacopedids have not always been recognized as stem-passerines, partly because they had a fourth (outermost) toe that was at least partially reversed. This feature (known as zygodactyly) is not found in modern passerines, in which only the first or innermost toe points backwards (as is typical of most modern birds). However, genetic data have consistently shown that the closest living relatives of passerines are parrots, which do have zygodactyl feet. In light of this, it is not so surprising that passerines appear to have evolved from zygodactyl ancestors. There are other noteworthy aspects of the phylogeny recovered by this study. One of the oldest known true passerines, Wieslochia from the early Oligocene of Germany, was found to be a suboscine, one of the two main passerine lineages. This makes sense given that the other main passerine lineage, the oscines or songbirds, is thought to have been confined to Australia during the early Oligocene. In addition, the halcyornithids, a group of Eocene birds once thought to be most closely related to parrots specifically, were found to be stem-members of Psittacopasserae, the group uniting both parrots and passerines. The results of the phylogenetic analysis run by Ksepka et al. (in press), from their study. Note that "Afroaves" should be labeled Australaves. In fact, the phylogeny of psittacopasserans found by this study is strikingly consistent with the results of Mayr (2015), despite the latter having used a much smaller dataset. However, the analysis from the description of Eofringillirostrum still lacks a few more early telluravians that might be interesting to include (such as the possible stem-falcon Masillaraptor and the parrot-like, apparently raptorial Messelastur). I am curious to see this dataset expanded further in the future. As far as we know, Eofringillirostrum was unique among psittacopedids for its seed-eating adaptations. Other psittacopedids had quite different skulls. Morsoravis had a generalized, thrush-like beak, suggesting a generalist diet of invertebrates and fruit. Psittacopes had a short, slightly downcurved beak, which is found in birds that mainly feed on insects but also eat seeds. Pumiliornis had a long beak and has been found with pollen as gut contents, indicating that it likely fed on nectar. It's often easy to imagine stem-groups as little more than intermediates "on their way" to becoming modern species, but Eofringillirostrum and other psittacopedids show that stem-passerines had their own independent burst of diversification, taking on ecological niches that true passerines wouldn't occupy until millions of years later. The skulls of stem-passerines (left) compared to those of extant passerines (right) that exhibit similar adaptations, from Ksepka et al. (in press). Morsoravis (A-B) is compared to a hermit thrush (I-J), Eofringillirostrum (C-D) is compared to an American goldfinch (K-L), Pumiliornis (E-F) is compared to a black-throated sunbird (M-N), and Psittacopes (G-H) is compared to a bearded reedling (O-P). Between Eofringillirostrum, fellow stem-passerine Zygodactylus ochlurus, the stem-hoopoe Laurillardia smoleni, the recently extinct penguin Eudyptes warhami, and the early waterfowl Conflicto, neornithine birds have so far had a strong showing among the new paleontological discoveries of this year. I can only hope that the rest of the year is just as good! PhD student studying fossil birds. Interested in maniraptoran dinosaurs in general. Alternatively, I'm an alvarezsaurid alvarezsaurian maniraptor from the early Maastrichian of Alberta, Canada, described by Longrich and Currie in 2009. Whatever suits you.